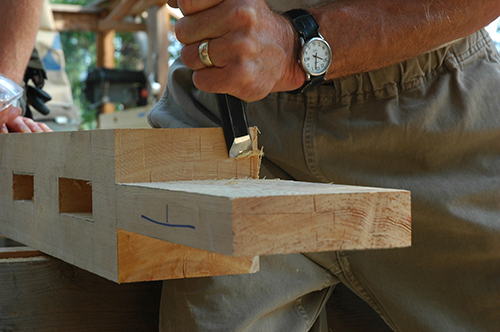 The art and craft of timber-framing is best learned through a rigorous training under the watchful eye of an experienced timber framer. There are many excellent books written on timber-frame building and some of our favorites are listed in the bibliography section. 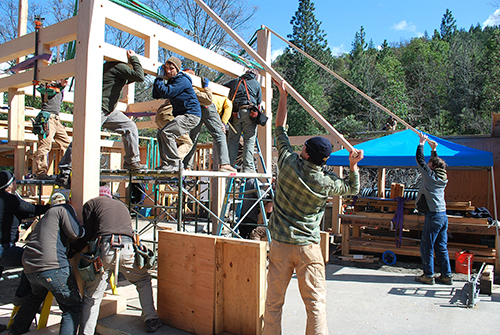 The intent of this chapter is to introduce the process of building a core timber-frame to one of our Peregrine Series homes -a taste of what students learn in the course of the EcoNest timber-frame workshop. Some of these students have never held a chisel before and others are already quite experienced and have come to hone their skills. Sharpening the Chisel Sharpening the mind. 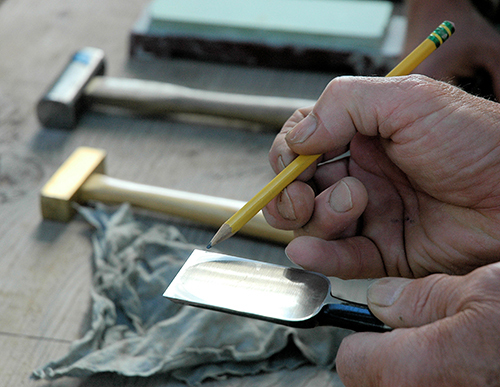 The first day of a timber frame work shop is dedicated to sharpening, fashioning a superior cutting edge on the chisel. 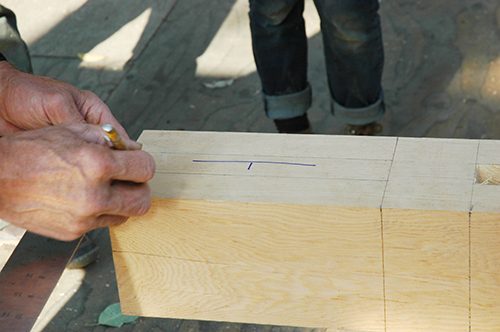 In this singular task an atmosphere of focus is set while each student creates a fundamental resource to cut wood joinery with precision and confidence. Their training has begun. Each student will go on to experience the various aspects of this craft, culminating in the raising of the finished frame. The timber frame plans are a set of working drawings presenting the frame members, their relationships to one another and precise dimensions. Clear plans become the basis for the timber framer to work out the required timbers, joinery, assembly process, and raising sequence. Layout begins by studying the timbers and orienting them for their best expression in the overall composition of the frame. Special consideration is given to posts and students learn how to orient them the same way the original tree grew in the forest. 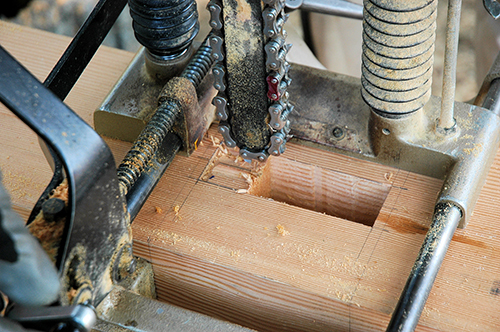 Cutting joinery is the systematic procedure of removing wood. Power tools such as mortisers, drills, saws and routers are used to remove most of the wood. Once roughed out the joints are finished with chisels, slicks and hand planes, carefully respecting the layout lines. Once all of the timbers are cut they are assembled into bents on a level ground surface. Here they are aligned with come-alongs and clamps, fine tuned to a perfect fit, and finally secured with pegs, wedges or keys. Bents are built in the reverse order of raising i.e. the final bent to be raised is the first to be built and will be at the bottom of the stack of bents created in preparation for raising. This is the most exciting part of the timber frame process, where the culmination of hundreds of hours of individual work comes together to create one beautiful entity…the timber frame heart of the home. Safely raising tons of wood in the air requires leadership, teamwork and focus. The pre-assembled bents are stood up by hand or with the aid of a crane. The first bent is temporarily braced freeing up the crane to raise the second bent which is also temporarily braced and spread to receive the connectors which will tie the two bents together. This process is repeated until the entire frame is erected. With the frame safe and secure it is racked into a plumb position and the connecting joinery is fine-tuned and secured. The day culminates with a traditional ridgetop ceremony. A pine bough is secured to the highest point of the building as a symbol of gratitude to nature.